The warmth and pearlescent glow of the wood is protected with a pre-catalytic lacquer finish with a semi-gloss sheen for everlasting beauty. 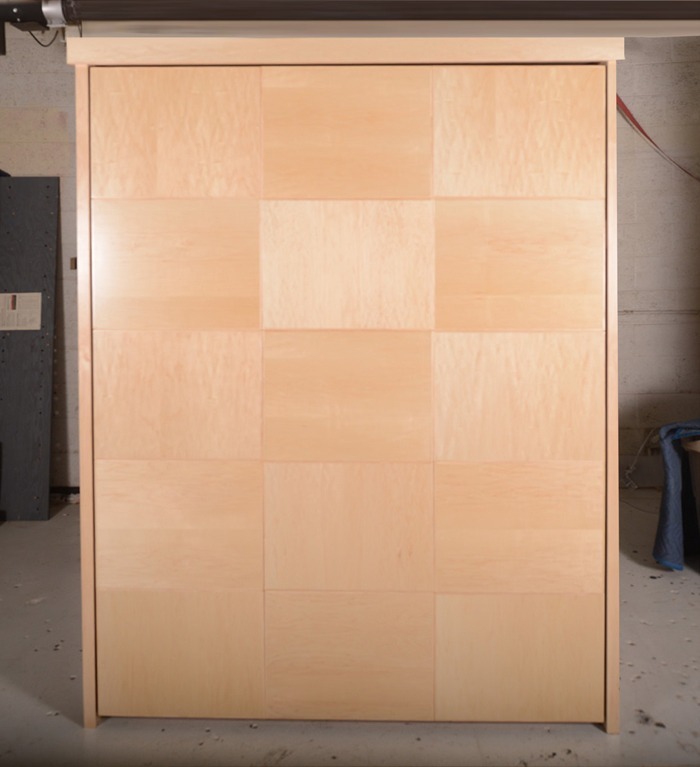 This checkerboard design is created from Hard White Maple. Grain pattern is plain slice cut. 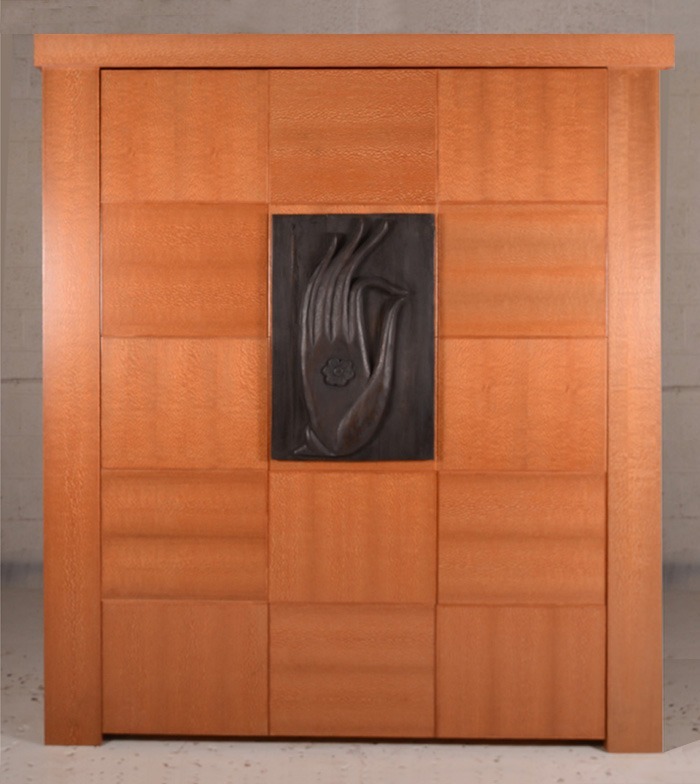 The maple’s natural color and texture variances are enhanced by alternating the direction of the grain which affects how light and color are perceived. Walnut’s unique grain is especially striking in a Zen pattern. Photos will be added soon, or ask us to email them to you! The simplicity of the Zen Bed is easily sophisticated to become a striking piece of furniture. With the addition of a mural or picture, a natural framing is in effect. 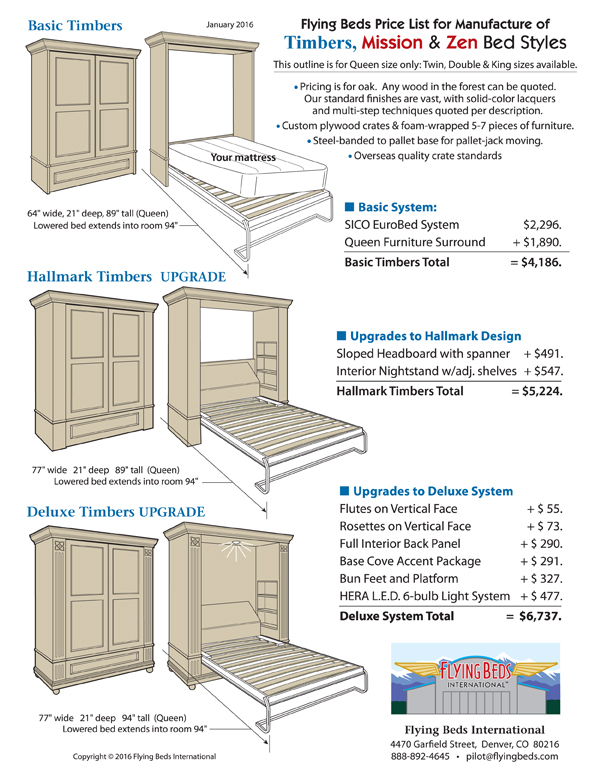 This system has the upgrades of interior hidden nightstands, sloped headboards and Hera® cold LED light system. Australian Lace Wood is part of a family of trees called “Silky Oak”. 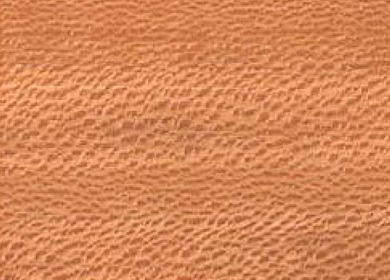 Lace Wood possesses one of the most unique grain patterns of all the Exotic Woods. Of medium-density, it has a fascinating visual pattern caused by the interlacing of light and dark striations that are richly highlighted when quartersawn. 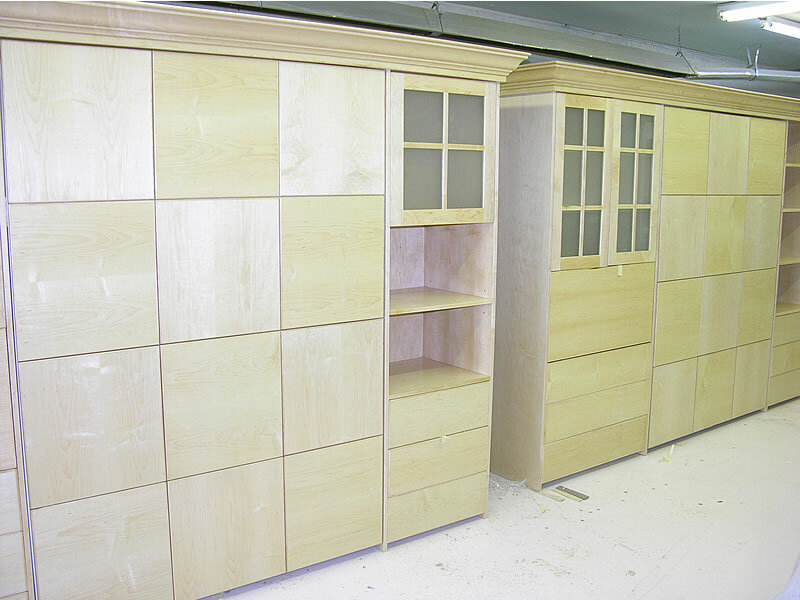 A new Chicago Sleep Center commissioned FlyingBeds to build these two Full size Murphy beds. They are chock full of features that make your sleep testing experience as comfortable as possible. 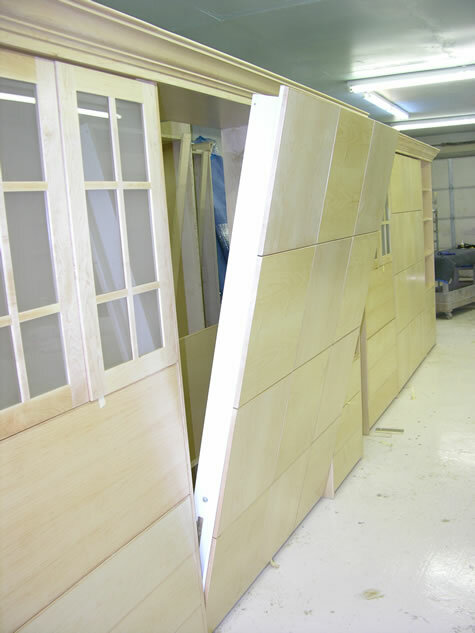 The two photos to the right suggest the benefits of using the SICO EuroBed Murphy bed mechanism. This arrangement guarantees a very comfortable sleep no matter whose mattress they use in the clinic. 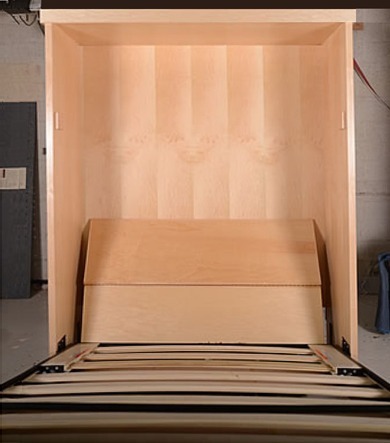 The two lift mechanisms you see near the front of the frame are located underneath the mattress. They are never visible. If you look closely at the side rail of the lowered bed, you can see a silver identification tag. Each of the SICO EuroBeds has a serial number typed on this tag with identification of manufacture. 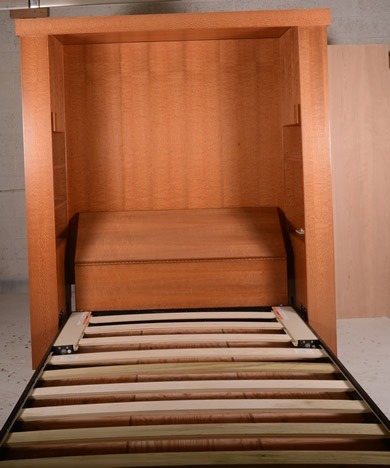 To my knowledge this is unique in the Murphy Bed Industry, and the reason I use SICO in my furniture factory.